The papal biographer’s new book describes his relationship with Pope John Paul, as well as the great challenges the pope faced in the final years of his life. George Weigel’s two biographies of St. John Paul II—Witness to Hope and The End and the Beginning—are widely considered the authoritative volumes on the life and work of the Polish pope. 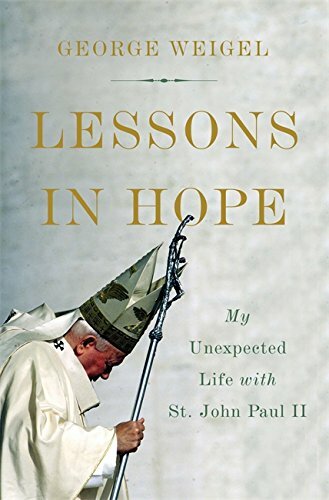 Weigel has a new book out, Lessons in Hope: My Unexpected Life with St. John Paul II (Basic Books), which focuses on his decades-long friendship with St. John Paul and on the inspiring witness the pope offered the world in the face of great suffering in the last years of his life. Weigel recently spoke to CWR editor Carl E. Olson about his new book. Carl E. Olson, for CWR: At the start of Lessons in Hope, you note that you thought Witness to Hope and The End and the Beginning, which totaled about 1,600 pages, contained all you could or would say about St. John Paul II. Why this third book? In what ways is this “album of memories,” as you describe it, different from the two biographies? George Weigel: Lessons in Hope is almost entirely anecdotal; it tells the stories that wouldn’t have “fit” into two volumes of biography, but that illuminate, in one way or another, interesting facets of John Paul II’s personality and way of conducting the papacy. I’ve discovered in recent years that this is what people want, now: not so much analysis of a remarkable personality and his accomplishment, but story-telling that brings him alive in a personal way. CWR: You write that the “experience of learning John Paul II and his life taught me a new way of looking at events in my own life…” What are some examples of that? And what are some of the events that paved the way for you to become John Paul II’s biographer? Weigel: At Fatima in 1983, one year after the assassination attempt that came within a few millimeters of taking his life, John Paul said, “In the designs of Providence, there are no mere coincidences.” What we think of as “coincidence,” or just happenstance or randomness, is actually a part of God’s providential guidance of history that we just don’t understand yet. That insight of his helped me to see how, for example, my philosophical and theological studies in college and graduate school, my work as a columnist and essayist, the people I met at the Woodrow Wilson International Center for Scholars in 1984-85, and a week in Moscow in 1990 fomenting nonviolent revolution were all providential experiences that prepared me to take on the job of being John Paul II’s biographer. CWR: One point made in several places is the importance of understanding John Paul II’s philosophical perspective and project. What are some key features of his philosophical work? And how has this been either misunderstood or even misrepresented? CWR: How did you first meet John Paul II and how did your friendship develop? Weigel: Our first real conversation was in September 1992, when I gave him a signed copy of The Final Revolution: The Resistance Church and the Collapse of Communism, which he had already read on galley proof. Things snowballed after that, both in terms of personal conversations and correspondence, and both conversation and correspondence continued after the publication of Witness to Hope. The details of how our relationship evolved over the course of my preparing Witness to Hope and afterwards—during the dramas of the Long Lent of 2002, the Iraq War, and his last illness—are described in detail in Lessons in Hope. CWR: John Paul II strongly encouraged you to meet with many of his friends from his time in university. Why was that so significant to him? How did that period of time shape the rest of his life? Weigel: It was not so much his friends from his own time in university (although I did meet with the surviving members of his underground wartime theatrical troupe, the Rhapsodic Theater), but the friends he made while he was a university chaplain in the late 1940s and early 1950s. As he was helping form them into mature Catholic adults, they were helping form him into one of the most dynamic and creative priests of his generation. He thought that story was crucial to understanding him “from the inside,” so he encouraged me to talk with these men and women, several of whom are now close friends of mine. CWR: You emphasize, as you have many times over the years, that your two biographies of John Paul II were not “authorized biographies.” What does that mean and why is it so important? 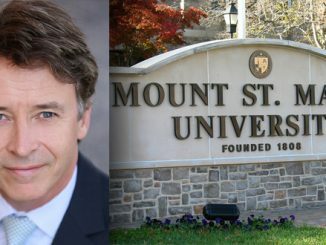 Weigel: An “authorized biography,” in the usual sense of the term, is one that has been vetted (and perhaps edited) by the subject or the subject’s heirs, in exchange for access and documents; so an authorized biography should be read with a certain reserve, given what one has to assume was the vetting involved. At the very outset of the Witness to Hope project, I told John Paul over dinner that he couldn’t see a word of what I wrote until I gave him the finished copy of the book, and he immediately responded, “That’s obvious.” He knew, as I knew, that there could be no one looking over my shoulder as I wrote if the book was to be credible; he also thought that the book was my responsibility and he wasn’t about to change a lifelong pastoral habit of challenging others to be responsible without imposing his own judgments. So while I hope Witness to Hope and The End and the Beginning are as authoritative as possible, they are in no sense “authorized.” I also hope that Lessons in Hope ends, once and for all, the urban legend that John Paul II asked me to write his biography. He didn’t. I suggested the project and he agreed to cooperate with it. CWR: What were some of the more challenging aspects of researching the life of John Paul II? Weigel: There were a lot of people in the Roman Curia who weren’t as eager for me to have full access to people and documents as John Paul II was, and the stories of my adventures in getting through that Italianiate obstacle course are very much part of Lessons in Hope. Then there were the problems posed by my predecessors in the papal biographers’ guild, like Tad Szulc and Carl Bernstein: people who had spoken freely with them felt that they had been burned, in the sense that Szulc and Bernstein had slotted their reflections into what these men and women who knew John Paul II well thought were nonsensical analyses. And it took a while for me to convince some of them that I was different. There was also the challenge of inviting a man with a deep sense of privacy to talk about aspects of his life he had rarely if ever discussed before; but John Paul answered every question I posed to him and in fact pushed me into exploring areas of his life to which I might otherwise have given short shrift. CWR: In discussing the “Long Lent”—the clerical sexual abuse scandal that broke in early 2002—you explain that there existed an “information gap” between Rome and the United States. Why did that gap exist? 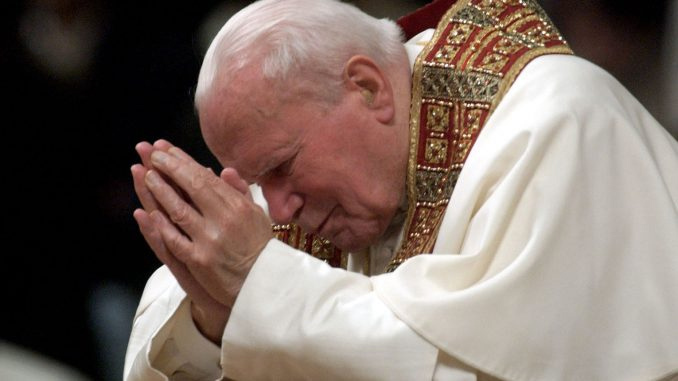 How well or poorly was John Paul II informed of what was happening? Weigel: The gap existed because of curial incapacity and the general Roman sense that “things can’t be as bad as all that,” which is too often applied to crises. The story of how the Pope got more fully informed of the situation, and my role in helping facilitate that, is told in detail in Lessons in Hope. CWR: What are some lessons from John Paul II that you think are especially apt now, in 2017? Weigel: In this time of turbulence in the Church it’s important to remember that we’re not in 1978. The growing parts of the Church throughout the world are the parts of the Church that have embraced what I’ve come to call “all-in Catholicism” as exemplified by the teaching of John Paul II and Benedict XVI, and the dying parts are those parts that continue to embrace Catholic Lite. This distinction is true of pastoral life, Catholic intellectual life, and the Church’s public witness. And that makes for a very, very different circumstance than the situation in 1978, when Catholic Lite pretty well ruled the roost. Catholic Lite is a failure and has no future; there is a compelling alternative to it, created by the Second Vatican Council as authoritatively interpreted by John Paul II; and if we all remembered that, things would be a little calmer these days. Vatican City, Apr 28, 2018 / 04:06 am (CNA/EWTN News).- Last night Pope Francis began individual meetings with three survivors of clerical sexual abuse from Chile following a major apology earlier this month. The encounters, which have no time limit, will go on throughout the weekend and on Monday. The survivors – Juan Carlos Cruz, James Hamilton and Andres Murillo – were invited by the pope to stay at the Vatican’s Saint Martha guesthouse, where he has lived since his election in 2013. Cruz, Hamilton and Murillo were each victims of abuse carried out by Chilean priest Fernando Karadima, who in 2011 was found guilty by the Congregation for the Doctrine of the Faith of sexually abusing several minors during the 1980s and 1990s, and sentenced to a life of prayer and solitude. The pope invited the three men to come to the Vatican after receiving a 2,300 page report from Maltese Archbishop Charles Scicluna, who is highly regarded as the Vatican’s top abuse investigator and who traveled to the United States and Chile in February to investigate allegations of cover-up. 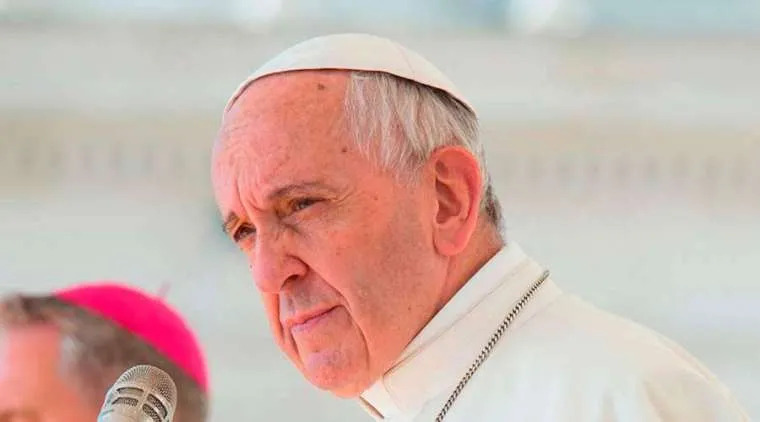 He invited Cruz, Hamilton and Murillo to meet with him privately at the Vatican, and summoned all of Chile’s 32 bishops to Rome in the third week of May, where they will discuss the conclusions of Scicluna’s report as well the pope’s own conclusions on the matter. In recent comments made to the New York Times, Cruz, who will meet with Francis Sunday, said he is looking forward to speaking with the pope with “an open heart” and hearing what the pontiff has to say. “And firing a few bishops won’t do the trick,” he said, voicing hope that Barros will be relieved from his post in Osorno. “Discernment is a remedy for the immobility of ‘it has always been so’ or ‘we take time,’” the Pope said Sept. 14. 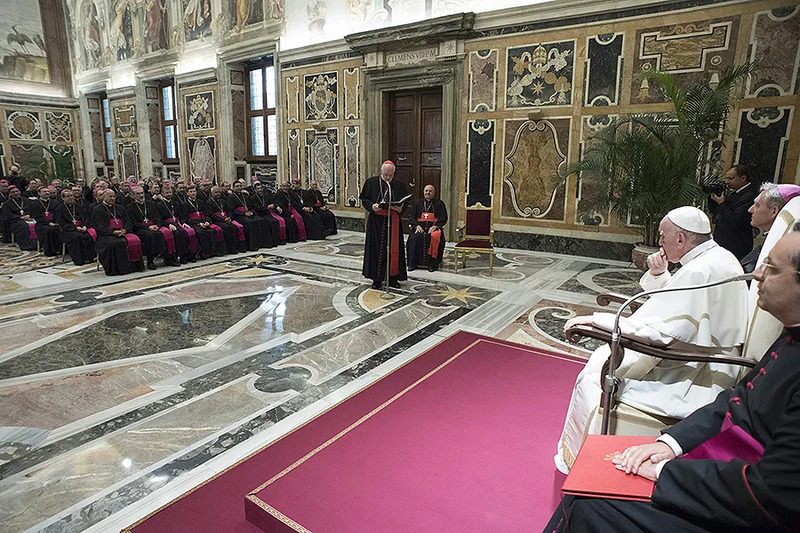 Pope Francis spoke in an audience with participants in the annual training course for new bishops held in Rome and organized by the Congregation of Bishops and the Congregation of Eastern Churches. He reminded them how important it is that they have humility, especially for the work of the Holy Spirit. “Remember that God was already present in your dioceses when you arrived and will still be there when you are gone,” he said. “Obedience with regard to the Gospel, the ultimate standard; to the Magisterium, who guards it; to the norms of the universal Church, which serve it; and to the concrete situation of people,” who are looking to draw from the Church what will be most fruitful to their salvation,” he said. Listening is necessary, because the bishop’s discernment is always a community action, he said, it does not disregard “the richness of the opinion of his priests and deacons, of the People of God, and of all those who can offer him a useful contribution” – even those which are more concrete than formal. “Discernment, therefore, is born in the heart and mind of the bishop through his prayer when he meets people and situations entrusted to him with the Divine Word pronounced by the Spirit,” he said. Because discernment isn’t just for the wise, clear-sighted, or perfect, he said. God often shows himself to the most humble, in fact. Vatican City, Jun 14, 2018 / 10:27 am (CNA/EWTN News).- After spending more than a decade in private collection in Atlanta, a copy of a 1493 letter written by Christopher Columbus about his experience in America has been returned to its rightful place in the Vatican library. Columbus penned the letter to Spanish King Ferdinand and Queen Isabella in 1493 after returning from his voyage to America, describing what he saw during his travels. 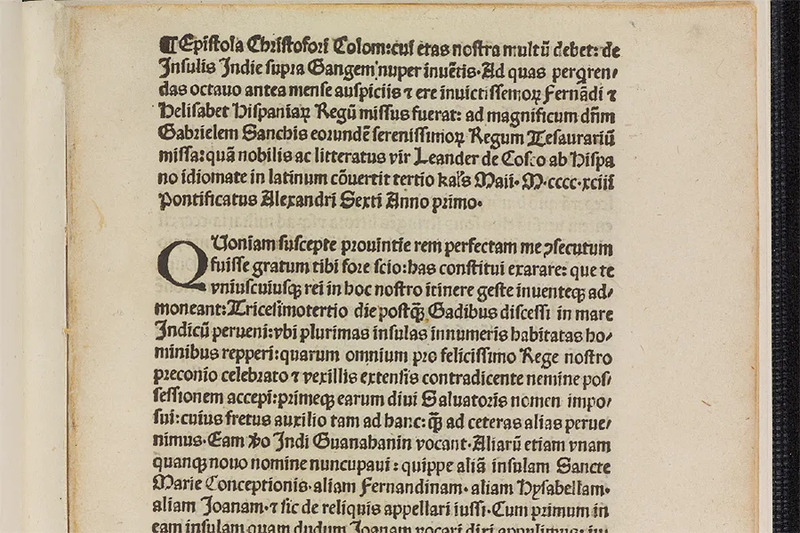 The “Columbus Letter,” unofficially titled “Letter about the Recently Discovered Islands,” was then translated and manually printed into Latin, and several copies were distributed throughout Europe. Around 80 authentic copies still exist today. One of the oldest copies of the 8-page letter, written in small, fine print, was given to the Vatican in 1921 as part of the “De Rossi Collection,” which consisted of rare books and manuscripts given to the Vatican at the request of bibliophile Giovanni Francesco Rossi upon his death in 1854. The original copy of the Vatican’s letter was eventually traced back to David Parsons, an actuary from Atlanta, who had purchased it for $875,000 from a rare book dealer in New York City in 2004, unaware that it had been stolen from the Vatican. It was confirmed in 2016 that the “Columbus Letter” Parsons owned had been sold to the New York book dealer he bought it from by notorious Italian book thief, Marino Massimo De Caro, who is currently serving a 7-year sentence in Italy for the theft of roughly 4,000 ancient books and manuscripts throughout Italy. After further comparative analysis was done on both the original letter and the forgery, it was confirmed in April 2017 that Parsons’ letter had in fact been stolen from the Vatican Library, and that the theft had to have taken place sometime before 2004. In August of that year, investigators contacted David Parsons’ widow, Mary Parsons, and presented her with evidence of the theft and forgery. She agreed to part with the letter, renouncing all rights, title and interest, so that it could be returned to its original home in the Vatican Library. The letter formally exchanged hands June 14, when U.S. Ambassador to the Holy See Callista Gingrich presented it to Vatican Archivist and Librarian, Archbishop Jean-Louis Bruguès, O.P. and the Library’s Prefect, Bishop Cesare Pasini, inside the Vatican Library. As a gesture of gratitude to Mrs. Parsons for agreeing to part with her late husband’s treasured “Columbus Letter,” the U.S. Embassy earlier this week hand-delivered a personal note from Mrs. Parsons to the pope. He said the library was “surprised” to find out their copy was a fake, and noted that while it is still unknown when the original letter was taken, the technique used in the forgery, called “stereotyping,” was a common during the late 19th and early 20th centuries and reproduces not only the visual characteristics of the original, but also the tactile characteristics. Although it may be matter of opinion I don’t believe most well read persons believed John Paul II was a throw back to pre Vat II thought. From his earliest years as a priest he was influenced by Max Scheler, a Jewish convert to Catholicism who was sanctioned by German Hierarchy for Scheler’s ethical thoughts on feelings and the “totality of good”. Following his initial doctorate [Faith in St John of the Cross] at the Angelicum Fr Wojtyla earned a second doctorate in Poland on the ethics of Scheler in an effort to accommodate the latter’s ethical thought and the compatibility of phenomenology with classical metaphysics. “In response to questions put to him by a Polish confrere a few days after being made pope, Karol Wojtyla replied I would say that in my life I’ve had two great philosophical revelations — Thomism and Scheler” (Catholic Culture). The book you refer to is titled The Acting Person first published in 1969 in Analecta Husserlianna. In the Acting Person we find affinity of “feeling” as understood by Scheler, and what Aquinas calls an “inner sense” in ethical discernment. John Paul II broke ground here not only for philosophy in a reconciliation of the Husserlian phenomenological effort to return to existence and St Thomas Aquinas. He also couched ethics understood as virtue rather than legalistic duty [Kant] in language more comprehensive to modern man evident in Veritatis Splendor. For example the person who acts virtuously is intent on the good of the act, its object as ordered to his understanding of the goodness of God rather than entirely on good intent. The acting person acts freely when he acts virtuously. As an anecdote I watched him and sought as a priest to identify with his virtuous suffering end stage Parkinson’s during the Liturgy at St Peter’s. It was that heroic example he gave priests that for myself most defines the man. This is all quite well said, except the book originally translated into English as “The Acting Person” was originally titled in Polish “Person and Act.” The original English translation has almost from the beginning come under heavy fire for the application of editorial discretion in the direction of phenomenology and away from the more metaphysically grounded perspective Wojtyla was obviously going for. So “Person and Act”, which I believe was retranslated later, is closer to Wojtyla’s actual thought. Again, I think the rest of this is well said. Thanks Stephen. The English translation I read at the Angelicum was an unpublished hand written copy by a Polish priest. Aside from the title there was more of an emphasis on Aquinas’ metaphysics than the standard translation that the priest meant to correct. There is another anecdote in relation to Max Scheler. Scheler following his conversion was responsible for the conversion of Edith Stein, an atheistic Jew and fellow philosopher at Gottingen. You likely know she became Sr Teresa Benedicta of the Cross. Stein was deeply immersed in the meaning of the Cross and the works of St John of the Cross. As was Karol Wojtyla. Apparently the future John Paul II had a fondness for Stein and was instrumental in her canonization. I read her noted work The Problem of Empathy in which she identifies an ethical awareness in empathy understood as a “religious consciousness,” a “kind of act of perceiving sui generis”. It was this existential form of phenomenology developed at Gottingen that attracted Pope John Paul II. Most, perhaps. I recall that Fr. Andrew Greeley, back in the late 1990s, called JPII a “fundamentalist”, which was both pathetic and revealing. I don’t think that was unusual at all among many progressive Catholic theologians and scholars, who mostly had very low for JPII’s thought and work. Sounds much like slams today about “rigidity,” etc. If I may add, G Weigel’s reference to Providence understood by John Paul II is extremely important, relevant to our extraordinary challenging moment in Church history. That events are not accidental. That God has some purpose as was evident in his own as well as the Pontiff’s life. It’s assurance to be reminded that whatever may transpire Justice will prevail. I am glad to see the comparison between “all-in” Catholicism and “Catholic-Lite”. Much better than “Evangelical and Counter-Reformation” Catholicism which was just divisive and a non-starter. I would refrain from categorizing the great mind of St Pope John Paul II as pre-modern or modern, or anything other than Catholic, universal and timeless. His works are still fairly unknown as they should be known, and the current papacy is doing all in its power to obliterate the work of St John Paul. I grew up during his papacy and he has been a great source of learning and inspiration, not just for me. I am currently reading his private diary, which covers the period of 1962 to 2003. From these pages one can feel and see already the great faith and genius of that blessed soul. That was a man who wasn’t afraid to question himself, who lived a life completely given to Jesus and His Church, who truly understood the mystery of the Cross and didn’t allow his early life trials to hinder his faith and ministry. He did all this in all humility and in submission to Jesus and to the one who ushered salvation into the world, Our Blessed Mother.